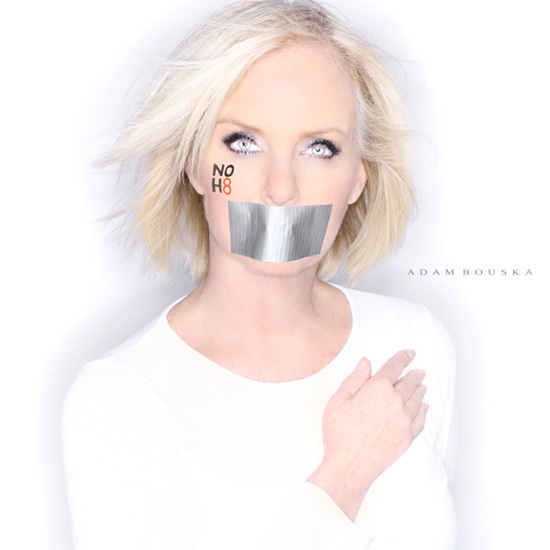 On Wednesday, the NOH8 campaign protesting California's Proposition 8 announced a new high-profile Republican supporter: John McCain's wife, Cindy McCain. NOH8 is a photo project in which subjects are photographed wearing white, against a white background, with their mouths taped shut and "NOH8" painted on their faces. The NOH8 website posted the following note, along with McCain's photo, expressing the campaign's surprise and appreciation that she decided to join the cause. In the year since we've started the NOH8 Campaign, we've been surprised at some of the different individuals who have approached us showing their support. Few, though, have surprised us more than Cindy McCain--the wife of Senator John McCain and mother to vocal marriage equality advocate Meghan McCain. The McCains are one of the most well-known Republican families in recent history, and for Mrs. McCain to have reached out to us to offer her support truly means a lot. Although we had worked with Meghan McCain before and we were aware of her own position, we'd never really thought the cause might be something her mother could get behind. Aligning yourself with the platform of gay marriage as a Republican still tends to be very stigmatic, but Cindy McCain wanted to participate in the campaign to show people that party doesn't matter - marriage equality isn't a Republican issue any more than it is a Democratic issue. It's about human rights, and everybody being treated equally in the eyes of the law that runs and protects this country.